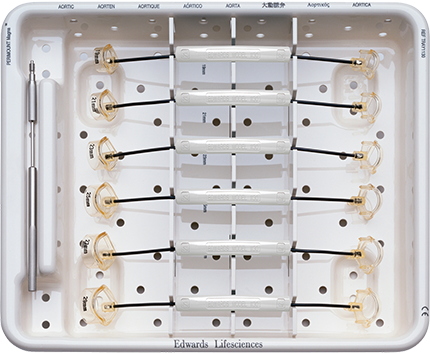 The Carpentier-Edwards aortic pericardial valve portfolio is built upon the PERIMOUNT bioprosthesis design. 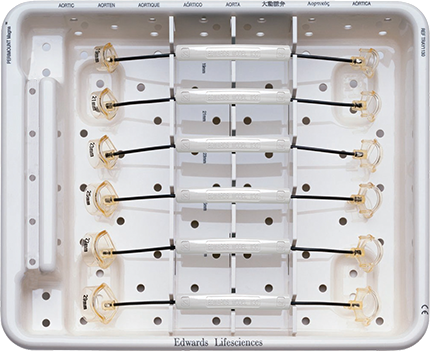 ‡ No clinical data are available that evaluate the long-term impact of the Edwards Lifesciences tissue treatments in patients. The Carpentier-Edwards PERIMOUNT Magna Ease pericardial aortic bioprosthesis is intended for use in patients whose aortic valvular disease is sufficiently advanced to warrant replacement of their natural valve with a prosthetic one. It is also intended for use in patients with a previously implanted aortic valve prosthesis that is no longer functioning adequately and requires replacement. In the latter case, the previously implanted prosthesis is surgically excised and replaced by the replacement prosthesis. Carpentier-Edwards PERIMOUNT pericardial aortic bioprosthesis. * Freedom from explant / prosthesis replacement / reoperation due to SVD. † Freedom from valve reoperation for prosthesis dysfunction and all other causes. Dalmau M, et al. The Carpentier-Edwards Perimount Magna aortic xenograft: a new design with an improved hemodynamic performance. Interactive Cardiovasc and Thoracic Surgery 2006;5:263–267. Ruzicka D, et al. The Complete Supraannular Concept, In Vivo Hemodynamics of Bovine and Porcine Aortic Bioprostheses. Circulation 2009;120(11 Suppl):S139-45. Wendt D, et al. The new St Jude Trifecta versus Carpentier-Edwards Magna and Magna Ease aortic bioprosthesis: Is there a hemodynamic superiority? J Thorac Cardiovasc Surg. 2014;147(5):1553-1560. The Magna valve (bioprosthesis) has a true supra-annular design for optimal hemodynamics and flow characteristics. The Carpentier-Edwards PERIMOUNT Magna pericardial aortic bioprosthesis is intended for use in patients whose aortic valvular disease is sufficiently advanced to warrant replacement of their natural valve with a prosthetic one. It is also intended for use in patients with a previously implanted aortic valve prosthesis that is no longer functioning adequately and requires replacement. In the latter case, the previously implanted prosthesis is surgically excised and replaced by the replacement prosthesis. ** Compared to a PERIMOUNT valve with the same external sewing ring diameter. 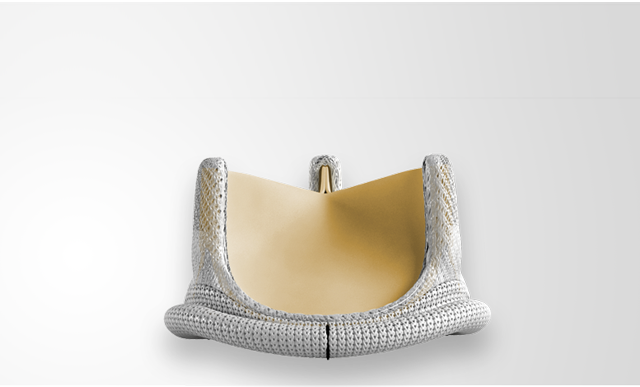 The Carpentier-Edwards PERIMOUNT RSR aortic valve combines a proven design with the benefits of pericardial tissue. 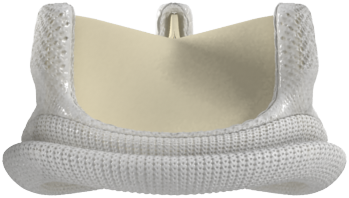 The Carpentier-Edwards PERIMOUNT pericardial aortic bioprosthesis is intended for use in patients whose aortic valvular disease is sufficiently advanced to warrant replacement of their natural valve with a prosthetic one. It is also intended for use in patients with a previously implanted aortic valve prosthesis that is no longer functioning adequately and requires replacement. In the latter case, the previously implanted prosthesis is surgically excised and replaced by the replacement prosthesis. 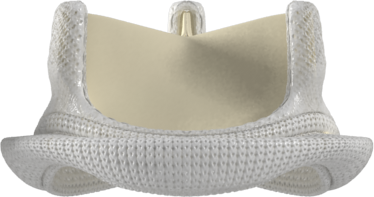 The Carpentier-Edwards PERIMOUNT aortic valve is the first biomechanically engineered valve designed specifically for the aortic position. It combines a proven design with the benefits of pericardial tissue. Contraindications: Do not use if surgeon believes it would be contrary to the patient’s best interests. Complications and side effects: Stenosis, regurgitation, endocarditis, hemolysis, thromboembolism, valve thrombosis, nonstructural dysfunction, structural valve deterioration, anemia, arrhythmia, hemorrhage, transient ischemic attack/stroke, congestive heart failure, myocardial infarction, angina, any of which could lead to reoperation, explantation, permanent disability, and death. Warnings: Alternative therapies should be considered in the presence of conditions affecting calcium metabolism or when calcium containing chronic drug therapies are used, including children, adolescents, young adults, and patients on a high calcium diet or maintenance hemodialysis. Should be used with caution in the presence of severe systemic hypertension or when anticipated patient longevity is longer than the known longevity of the prosthesis.